Lyndsay Taylor brought her 4-H project to Whittier’s ‘Green Thumb Fest’ on Saturday — a few hundred starter plants that the teenager grew from seeds in a 4-H greenhouse. Above, Regina Swimmer of Cherokee selects one of Lyndsay’s hanging baskets. Other choices included cabbage, broccoli, cauliflower, tomato, pepper and flowering plants. If you missed the Whittier festival, Lyndsay has plenty more plants for sale at the Lyntree 4-H Greenhouse at 995 Needmore Road — next door to the Maple Springs Baptist Church, about a mile off US 74. 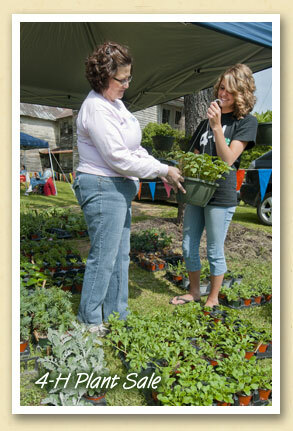 Lyndsay says “if I’m not there, just select your plants and pay on the honor system.” For information, call 488-3934.